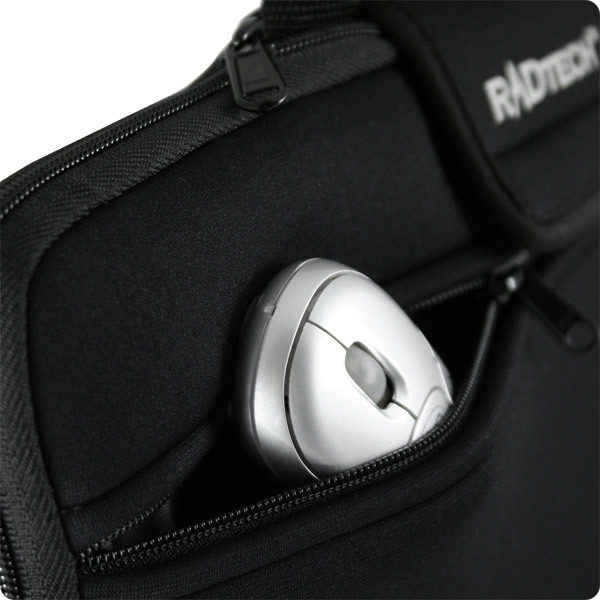 Sleek and durable water repellant Neoprene sleeve features retractable handles and unique use-in capability. Description: Engage your missions with precise, minimalist style - confident and ready for any assault. Upgrade your notebook's durability, functionality and style without bulking it up. 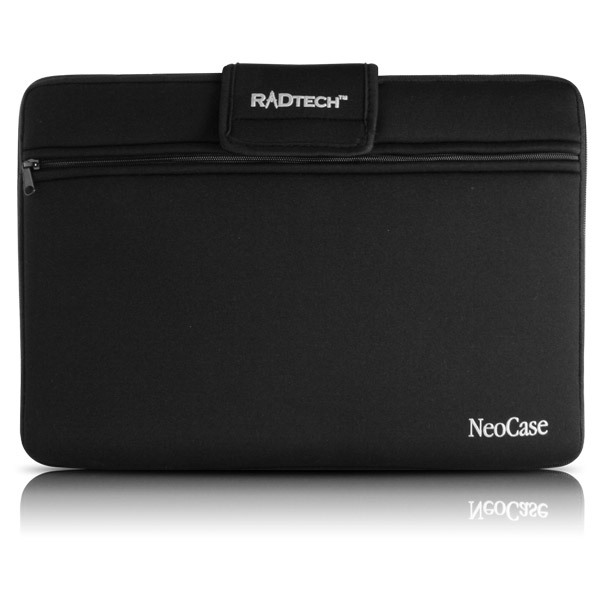 Constructed from water-repellant, 3mm Type-W Siliconized Neoprene, RadTech's NeoCase sleeve offers sleek and stylish protection. Features convenient use-in capability, with retractable ballistic Nylon handles and top-grade YKK zippers throughout - flange protected, so they'll never strike your payload. Conquer whatever life throws at you with 3 millimeters of high-density, edge-reinforced, water-repellent Neoprene jacketing your 'book. NeoCase ensures that you remain fully-functional, and ready to work anywhere, and in record time thanks to it's unique stay-on capability. Disengage the over-strap, unzip and roll. Use it alone with it's tough and comfortable handles, or feed it into the breach of your larger bag or pack - either way, your notebook is confidently protected. 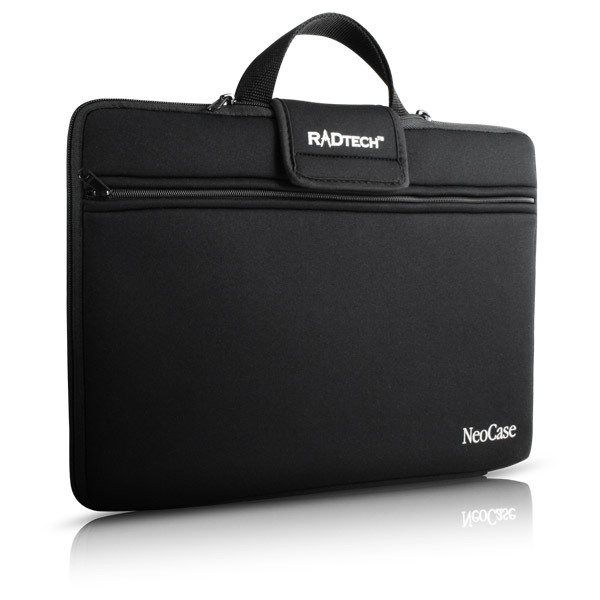 Work anywhere with light-weight, stealthy and time-saving confidence - RadTech's NeoCase delivers! Notebook protected by shock absorbing 3mm high-density Neoprene. Confidently handles the extremes - tough and water-repellent. Deployable ballistic Nylon handles and Velcro-secured over-strap. 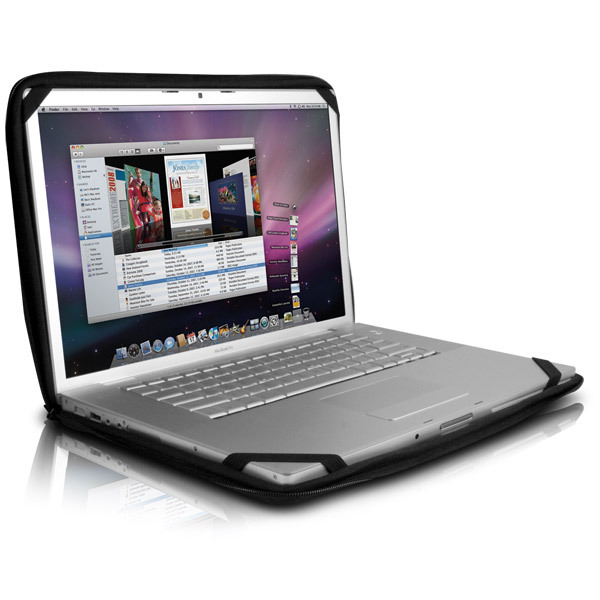 Elastic corner retention straps keep notebook locked and loaded when using in stay-on mode. Stealth black color compliments any uniform or urban disguise. Top-grade, internally flanged YKK zippers throughout.